DIE Sabbati, videlicet, 11 die Junii. Message from the H. C. for the Commissioners for Irish Affairs to meet every Day. 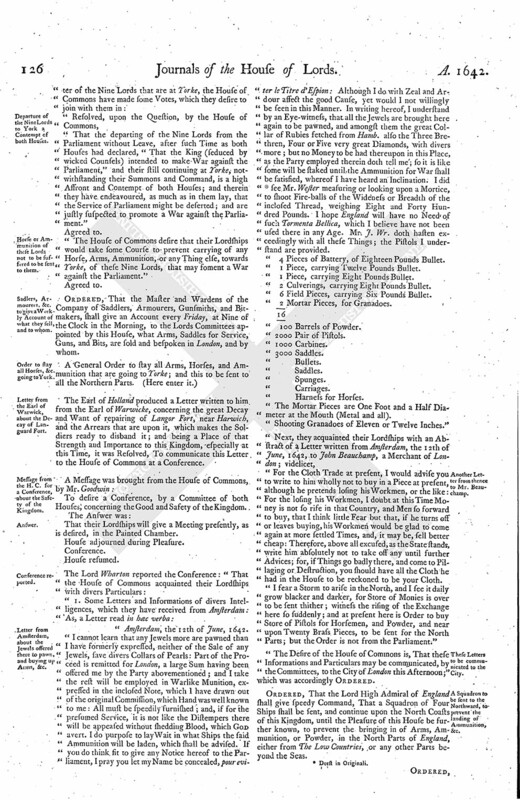 Mr. Wiseman examined, about the Proclamation in the City, concerning the Militia. Committee to examine this Business. Lord Mayor to attend, upon Notice. Report concerning the Amendments to the Treaty with the Scots Commissioners. Message from the H. C. for a Conference on the Letter from the Lords at York. Committee to return Thanks to the City, for their Readiness in the Loan to the Parliament. Conference about the Letter from the Lords at York reported. Departure of the Nine Lords to York a Contempt of both Houses. Horse of Ammunition of these Lords not to be susfered to be sent to them. Sadlers, Armourers, &c. to give a Weekly Account of what they sell, and to whom. Order to stay all Horses, &c. going to York. Letter from the Earl of Warwick, about the Decay of Languard Fort. Message from the H. C. for a Conference, about the Safety of the Kingdom. Letter from Amsterdam, about the Jewels offered there to pawn, and buying up Arms, &c.
Another Letter from thence to Mr. Beauchamp. These Letters to be communicated to the City. A Squadron to be sent to the Northward, to prevent the landing of Ammunition, &c.
Two Lords to move the Dutch Ambassador that the Money and Ammunition may be stayed in Holland. Committee to receive the Weekly Accounts of the Armourers, &c.
Message to the H. C. that the Lords have empowered their Committee to communicate the Intelligence from Holland to the City. To let their Lordships know, that the House of Commons have received several Informations of great Weight concerning the Irish Affairs; and because the House of Commons conceives they will be better transacted by the Commissioners than to come rawly and indigested to the Houses, they have appointed the Commissioners of their House to sit upon the Commission every Day at Three a Clock, and take those Things into Consideration; and the House of Commons desires their Lordships to give the same Command to the Lords Commissioners to meet accordingly. Ordered, That this House appoints, that the Lords Commissioners do meet every Day, at the Commission for the Irish Affairs. The Earl of Bedford excused for his Absence this Day. Mr. Wiseman, according to the Order of this House, was brought as a Delinquent, concerning the publishing of the Proclamation against the Militia; and being examined, he said, "The Lord Mayor bid him go home to his House, and fetch the Writ to proclaim the Proclamation; and he gave it to the Lord Mayor, and then the Lord Mayor bid him give it to the Officer to proclaim it; and accordingly he did. "He consessed he had One of the Proclamations from Fynch, but never read it, only the first Three or Four Lines; only he heard it from others, it was concerning the Militia, but not from the Lord Mayor. "That Fynch afterwards came to him to Guildhall, and telling him there was such a Disturbance that he durst not proclaim the Proclamation without Danger; and upon this he went and told the Lord Mayor hereof, and the Lord Mayor bid him tell the Officer he must take Help and dispatch it. "He denied he spoke those Words to Fynch, That he would be undone, and he was a Fool, & c."
Resolved, upon the Question, That Mr. Wiseman shall be committed to the Prison of The Fleet, during the further Pleasure of this House. Any Three of their Lordships to meet on Monday Morning; and afterwards to adjourn from Time to Time, as they shall please. Ordered, That the Lord Mayor shall be dismissed for the present, and shall appear again before this House upon Warning. 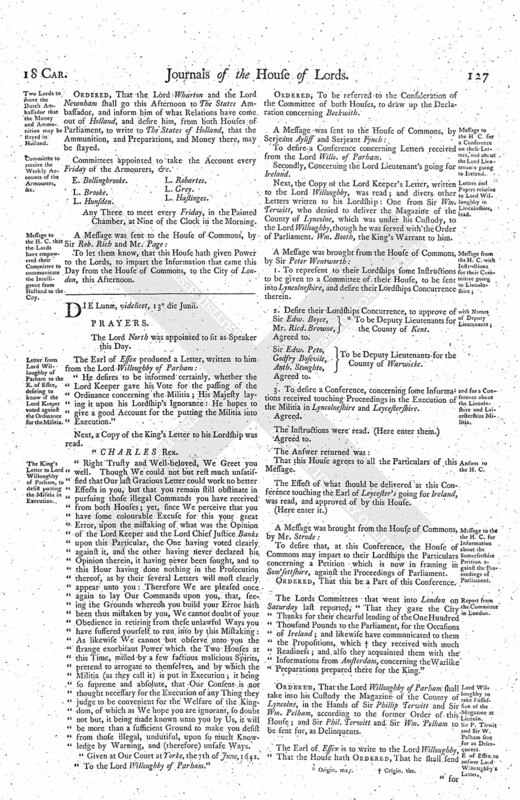 The Lord Brooke reported from the Committee, which was appointed to compare the Result of the Treaty with the Scotts Commissioners with the former Resolutions; and the Committees do find that, in the Third Article, these Words are new ["as they shall receive Orders from the chief Commanders of the Scotts Army for the Time being"]. And, upon Debate, these Words were thought fit to be added by this House ["according to Instructions received, or to be received, from the Lord Admiral to that Purpose"]. In the Fourth Article, the Word ["remain"] was not propounded, nor agreed upon, in the Lords House. And, upon Debate, it was put to the Question, whether the Word ["remain"] should pass as it came from the House of Commons, with the Addition of these Words ["the choosing of the Officers being still in the Power of the chief Governor of Ireland"]. 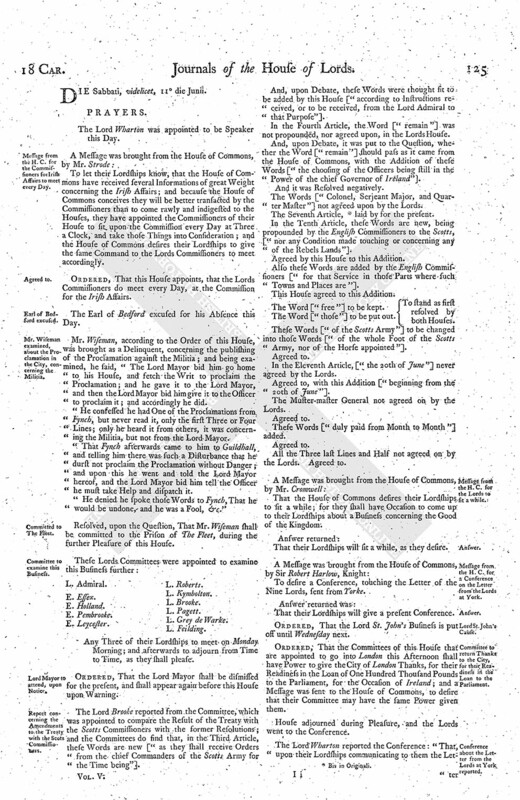 The Words ["Colonel, Serjeant Major, and Quarter Master"] not agreed upon by the Lords. The Seventh Article, (fn. 1) laid by for the present. In the Tenth Article, these Words are new, being propounded by the English Commissioners to the Scotts, ["nor any Condition made touching or concerning any of the Rebels Lands"]. Agreed by this House to this Addition. Also these Words are added by the English Commissioners ["for that Service in those Parts where such Towns and Places are"]. This House agreed to this Addition. The Word ["free"] to be kept. The Word ["those"] to be put out. To stand as first resolved by both Houses. These Words ["of the Scotts Army"] to be changed into those Words ["of the whole Foot of the Scotts Army, nor of the Horse appointed"]. In the Eleventh Article, ["the 20th of June"] never agreed by the Lords. Agreed to, with this Addition ["beginning from the 20th of June"]. The Muster-master General not agreed on by the Lords. These Words ["duly paid from Month to Month"] added. All the Three last Lines and Half not agreed on by the Lords. Agreed to. That the House of Commons desires their Lordships to sit a while; for they shall have Occasion to come up to their Lordships about a Business concerning the Good of the Kingdom. That their Lordships will sit a while, as they desire. To desire a Conference, touching the Letter of the Nine Lords, sent from Yorke. That their Lordships will give a present Conference. Ordered, That the Lord St. John's Business is put off until Wednesday next. Ordered, That the Committees of this House that are appointed to go into London this Afternoon shall have Power to give the City of London Thanks, for their Readiness in the Loan of One Hundred Thousand Pounds to the Parliament, for the Occasion of Ireland; and a Message was sent to the House of Commons, to desire that their Committee may have the same Power given them. "That the departing of the Nine Lords from the Parliament without Leave, after such Time as both Houses had declared, "That the King (seduced by wicked Counsels) intended to make War against the Parliament," and their still continuing at Yorke, notwithstanding their Summons and Command, is a high Affront and Contempt of both Houses; and therein they have endeavoured, as much as in them lay, that the Service of Parliament might be deserted; and are justly suspected to promote a War against the Parliament." "The House of Commons desire that their Lordships would take some Course to prevent carrying of any Horse, Arms, Ammunition, or any Thing else, towards Yorke, of these Nine Lords, that may soment a War against the Parliament." Ordered, That the Master and Wardens of the Company of Saddlers, Armourers, Gunsmiths, and Bitmakers, shall give an Account every Friday, at Nine of the Clock in the Morning, to the Lords Committees appointed by this House, what Arms, Saddles for Service, Guns, and Bits, are sold and bespoken in London, and by whom. The Earl of Holland produced a Letter written to him from the Earl of Warwicke, concerning the great Decay and Want of repairing of Langor Fort, near Harwich, and the Arrears that are upon it, which makes the Soldiers ready to disband it; and being a Place of that Strength and Importance to this Kingdom, especially at this Time, it was Resolved, To communicate this Letter to the House of Commons at a Conference. To desire a Conference, by a Committee of both Houses, concerning the Good and Safety of the Kingdom. That their Lordships will give a Meeting presently, as is desired, in the Painted Chamber. "Amsterdam, the 12th of June, 1642. "I cannot learn that any Jewels more are pawned than I have formerly expressed, neither of the Sale of any Jewels, save divers Collars of Pearls: Part of the Proceed is remitted for London, a large Sum having been offered me by the Party abovementioned; and I take the rest will be employed in Warlike Munition, expressed in the inclosed Note, which I have drawn out of the original Commission, which Hand was well known to me: All must be speedily furnished; and, if for the presumed Service, it is not like the Distempers there will be appeased without shedding Blood, which God avert. I do purpose to lay Wait in what Ships the said Ammunition will be laden, which shall be advised. If you do think fit to give any Notice hereof to the Parliament, I pray you let my Name be concealed, pour eviter le Titre d' Espion: Although I do with Zeal and Ardour affect the good Cause, yet would I not willingly be seen in this Manner. In writing hereof, I understand by an Eye-witness, that all the Jewels are brought here again to be pawned, and amongst them the great Collar of Rubies fetched from Hamb. also the Three Brethren, Four or Five very great Diamonds, with divers more; but no Money to be had thereupon in this Place, as the Party employed therein doth tell me; so it is like some will be staked until the Ammunition for War shall be satisfied, whereof I have heard an Inclination. I did (fn. 2) see Mr. Wester measuring or looking upon a Mortice, to shoot Fire-balls of the Wideness or Breadth of the inclosed Thread, weighing Eight and Forty Hundred Pounds. I hope England will have no Need of such Tormenta Bellica, which I believe have not been used there in any Age. Mr. J. Wr. doth hasten exceedingly with all these Things; the Pistols I understand are provided. "4 Pieces of Battery, of Eighteen Pounds Bullet. 1 Piece, carrying Twelve Pounds Bullet. 1 Piece, carrying Eight Pounds Bullet. 2 Culverings, carrying Eight Pounds Bullet. 6 Field Pieces, carrying Six Pounds Bullet. 2 Mortar Pieces, for Granadoes. "The Mortar Pieces are One Foot and a Half Diameter at the Mouth (Metal and all). "Shooting Granadoes of Eleven or Twelve Inches." "For the Cloth Trade at present, I would advise you to write to him wholly not to buy in a Piece at present, although he pretends losing his Workmen, or the like: For the losing his Workmen, I doubt at this Time Money is not so rise in that Country, and Men so forward to buy, that I think little Fear but that, if he turns off or leaves buying, his Workmen would be glad to come again at more settled Times, and, it may be, sell better cheap: Therefore, above all excused, as the State stands, write him absolutely not to take off any until further Advices; for, if Things go badly there, and come to Pillaging or Destruction, you should have all the Cloth he had in the House to be reckoned to be your Cloth. "I fear a Storm to arise in the North, and I see it daily grow blacker and darker, for Store of Monies is over to be sent thither; witness the rising of the Exchange here so suddenly; and at present here is Order to buy Store of Pistols for Horsemen, and Powder, and near upon Twenty Brass Pieces, to be sent for the North Parts; but the Order is not from the Parliament." "The Desire of the House of Commons is, That these Informations and Particulars may be communicated, by the Committees, to the City of London this Afternoon;" which was accordingly Ordered. Ordered, That the Lord High Admiral of England shall give speedy Command, That a Squadron of Four Ships shall be sent, and continue upon the North Coasts of this Kingdom, until the Pleasure of this House be further known, to prevent the bringing in of Arms, Ammunition, or Powder, in the North Parts of England, either from The Low Countries, or any other Parts beyond the Seas. Ordered, That the Lord Wharton and the Lord Newnham shall go this Afternoon to The States Ambassador, and inform him of what Relations have come out of Holland, and desire him, from both Houses of Parliament, to write to The States of Holland, that the Ammunition, and Preparations, and Money there, may be stayed. Committees appointed to take the Account every Friday of the Armourers, &c.
Any Three to meet every Friday, in the Painted Chamber, at Nine of the Clock in the Morning. To let them know, that this House hath given Power to the Lords, to impart the Information that came this Day from the House of Commons, to the City of London, this Afternoon.